If Leeds United fans were asked to name their favourite forward of the 1980s, it's a fair bet that legendary striking icon Ian Baird would top the list. The hard-as-nails number nine was as brave as they come, scared many an opposing defender senseless – as celebrated in the famous mid-80s Kop ditty of "Bairdy's going to get you" – and bagged a fair few goals to boot. Born in Rotherham, Baird moved to Hampshire as a youngster and while the Tudor Rose is dearest to his heart, the White Rose of United will always stir in the 44-year-old, who enjoyed two golden spells at LS11. Unquenchable commitment and a run-through-brick-walls mentality soon massively endeared the fearless young striker to the Whites faithful he was first acquainted with in early 1985. Putting his body on the line week in, week out was taken as read with Baird, who now resides on the south coast where he combines working in the motor trade with managing Blue Square South outfit Eastleigh. Many supporters fondly remember Baird, who has also managed Havant and Waterlooville, putting his head in where the boots were flying to power home a header in the memorable FA Cup fifth-round win over QPR at a packed Elland Road en route to the semi-final in 1987. But the granite forward acknowledges that an entirely different headstrong moment proved far more fateful for him three years later. Baird insists that the one major regret in his long professional career was calling time on his second stint in West Yorkshire in early 1990 – which ultimately cost him the chance of claiming a Division One title winners' medal. The impression at the time was that Baird was the fall-guy when boss Howard Wilkinson snapped up Lee Chapman from Nottingham Forest in a 400,000 move and seemingly forced the fans' favourite out of the door to Middlesbrough. But the striker, who started his career at Southampton, insists he only had himself to blame for engineering a move away from Leeds, while in a fit of rage. Not far short of 19 years on and a much wiser Baird still admits to feeling a sense of "what might have been" at his fateful decision. The much-loved ex-Whites frontman told the YEP: "As you get older, you look back at things. If I had been a bit more patient, I'd have got a championship medal in the old first division and played in the Champions League, like Shutty (Carl Shutt) and some of the lads who didn't figure around the time I left. But you live and die by your decisions and what's happened has happened. "Me being the way I was then, which was very impatient, cost me. We had a very good squad with the likes of Vinnie Jones, Chris Fairclough and Gordon Strachan and some great young players such as Speedo (Gary Speed) and Batts (David Batty). Unfortunately for me, I was playing well but not scoring. Bobby Davison was and we felt it was a good partnership. Then I'll always remember Howard signed Lee Chapman. "Stupidly – and it's a big regret of mine now – I went storming in to see Howard and said 'I'm not having this and why have you signed him, blah, blah, blah'. "And he just said 'I've signed him to strengthen the squad'. I replied, 'well no, I want to leave' and he said 'what do you want to leave for?'. I said I wasn't playing second fiddle to anybody, which was stupid at the time. Howard then said he wanted me to stay, and I just replied 'I don't'. "He wanted to negotiate a new contract with me, because my contract was coming up. But within half-an-hour of me having that conversation in his office, Bruce Rioch was on the phone. And the rest, they say, is history. "It's a big regret because Bobby didn't really play a lot in the run-in. Shutty was playing in the reserves at the time and my impetuous behaviour cost me. "I remember scoring against Newcastle on the first day of the season and then on the last day, I scored twice against them for Boro. It helped Boro stay up and Leeds – who were down at Bournemouth – go up as Newcastle were their rivals. It was a funny evening. "At least I got a Division Two championship medal as I was involved in about 30-odd games." Another lion-hearted former Whites forward, Joe Jordan, helped sway a young Baird towards joining United in the mid-80s, the start of an association with a club he will always carry a torch for. That said, another fateful decision before he left United for the first time at the end of the 1986-87 season also unwittingly cost him silverware. Glasgow giants Celtic were among four clubs keen on landing Baird – who had plundered 37 goals in 101 games for Leeds – in the summer of 1987, but he unwisely elected to head back south to Portsmouth. The Bhoys went on to claim the league and cup double in 1988 but by that time, Baird was back at Leeds after his Pompey nightmare. He said: "At the end of 1986-87, my contract was up. I went for talks with Celtic, Aberdeen, Portsmouth and West Ham. I ended up, stupidly, signing for Portsmouth. "Billy Bremner didn't want to give me what I was looking for and I wasn't looking for a lot. I just thought I deserved to be paid what some of the other players were on. "They weren't prepared to do that, but as soon as they found out other clubs were interested in me, they came back and offered me a new and improved contract. But I'd made up my mind to go. I went to Portsmouth where Alan Ball had got them promoted to the old first division. "I liked what he had to say and turned down Celtic, Aberdeen and West Ham. But as soon as I got to Portsmouth, I realised I'd made a bad error. Things weren't right at the club and within nine months I was back at Leeds." "But when Leeds came in for me, I remember Joe Jordan was playing for Southampton and I spoke to him about it. He just said that if I got the opportunity, I'd got to go. Even though back in '85 Leeds were pretty much in the doldrums compared to where they were before. "Eddie Gray was the manager and Jimmy Lumsden was his assistant. As soon as I got up there – I went up with my dad on a Sunday afternoon and Hunslet rugby league team were playing on the pitch – I could see Elland Road was still a tremendous stadium. "Eddie persuaded me to sign; to be fair I didn't take much persuasion. And I seemed to walk into a very, very good young side. I think Leeds were after a big centre-forward to play with Tommy Wright and we seemed to click. We almost got promoted and weren't far away. "The difference between Leeds and Southampton – no disrespect to Southampton – was massive in terms of fans' intensity and fervour. It was just something else at Leeds. "I used to have a Transit full of my mates who used to come to every game and they started supporting Leeds. My brother supported Leeds anyway. We finished the season well in '85 and we started the next season off as promotion favourites. Unfortunately, we had a bad start, Eddie got the sack and Billy Bremner came in and he, along with Eddie, was brilliant, especially with the younger lads. "We made some decent signings and ended up getting beat in the play-off semi-final and the FA Cup semi-final the following season, which was disappointing. "The cup run was great. Everyone remembers the QPR game. It was a good result and a good scalp, because they were in the first division and we were in the second. They were a very good side and I remember Gary Bannister booting me in the head and I needed about eight stitches. But I was lucky enough to score. "The semi-final was very, very disappointing because we dominated much of the game and were 1-0 up through Dave Rennie. It was just one of those things; as soon as I saw Micky Gynn come on, I thought 'here we go'. He and Keith Houchen scored. Keith ended up etching his name in history at Coventry and scored two in the final." On his enduring popularity with Whites' fans, Baird said: "I certainly enjoyed it at Leeds. Even now, I always seem to bump into Leeds fans somewhere and they always recognise me, even though I look like Bobby Charlton! "The Leeds fans were very good to me and still seem to be now. I live in Southampton now, there's a Hampshire Whites supporters' club and I've been president for the last three or four years. "They always invite me down when they have functions and they've had the likes of Kevin Blackwell and Ken Bates down. 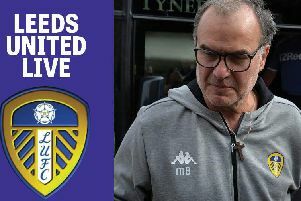 I've still got friends in Leeds and am in touch with (football agent) Hayden Evans, who is a big Leeds fan, all the time, as I am with the people I lived near when I was in Yorkshire. So I'm still a Leeds fan and a watcher! "These days I deal in cars and do a bit in property. But at this moment in time, nothing's very good and the credit crunch hits us all. "Managing at Eastleigh keeps me involved in football at least and anybody who has played professionally will say they still miss the buzz – of the dressing room and the Saturday. "A lot of old footballers like me can't live without it, even though it's still painful when you lose!"